Each building must have an inch of vacant land. This small land will determine to increase your beauty home . Display a park certainly did not depend on the size and area of land. If done with care and a mature design, a small garden can beautify the home as a whole. There are various ways to impress a cute little garden and wonderful. 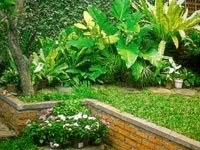 Having a small garden at home is strongly recommended that in addition to beautify the face of the house will also be very good for the health and psychological. First, if we have a limited area (narrow), one formula is not to have a desire to move other people into the park park itself. This is because people tend to want to have what has been a neighbor or someone else. Because our land is limited, make a small garden with various kinds of plants that are also small (stunted) this is to achieve a balanced proportion between the park with the facade of our house. Second, what about the direction of sunlight, this will affect the lighting conditions with a selection of garden plants. If the park does not get enough sunlight, can select the type of plants that like shade (not really need the sun). Circulation direction of the sun is very important because it affects the process in plants fotosintetic in our garden. Third, soil conditions and water absorption. To produce a good garden requires good soil conditions. Categorized fertile soil if high levels manure making it easier to absorb water. For big cities, usually less fertile soil conditions for the necessary treatment before make garden. Namely by mixing the soil with manure or compost. To set up a tiny garden, there are two important elements that determine the soft (soft material) and hard elements (hard material). Elements of this software consists of what types of plants we will plant. Are shrubs, vines (Alamanda cathartica), shade plants, flowering plants and ground cover plants (such as purslane, blue eyes, onion or grass). Noteworthy is the proportion of plants that are low to tall plants, so that looks interesting. Water also include software elements which we often present in the park. With limitations of our land we can by making a small pond with a mini waterfall in the wall that had been transformed with rocks form a cliff park. This cliff park other than for aesthetic reasons also serve to hide the wall a massive house and slippery. In addition, as a way out if the soil conditions in our homes is very barren and infertile. The presence of water pools with a constant flow of cool air will add to the garden. To facilitate the required water circulation pump automatically so that water circulation is maintained. Gurgling sound of water will add to the atmosphere calm and quiet. To further highlight the natural nuances, it is useful plants equipped with water or with a special urn. Water plants like lotus, or water poppies will be able to release a loud impression presented by the rocks. To avoid a mosquito nest maintained a good idea too few fish placed in the pool. While elements of hard rock, which is often used as a supporter of the beauty of the park. This natural stone slab with a form of irregular composition can serve as a path and will add a natural impression. Park did not always have a path, but this road serves as a circulation that allows us to explore the whole park without stepping on grass or soil. There are different types of natural stone selection in the market has to offer, live according to our tastes and pockets. The beauty of small gardens more complete if it is added to the sculpture as well as aesthetic ornaments garden lighting. In addition to the lighting, this lamp will make the park look dramatic at night. Aesthetic ornaments such as jars would also make a small garden look more attractive.